Indicas are ubiquitous in India. You see them everywhere and being used by every one from city folks to taxi operators, more by the latter these days. It has been Tata Motors' bread and butter for over a decade and even now sells alongside the newer generation Indica Vista which uses Fiat's 1.3-litre Multijet/Quadrajet diesel. The Indica though still makes do with the older generation 1.4 diesel with which it was launched, of course with continuous improvements including the addition of a turbocharger. And now, to keep pace with the times there's a further upgrade - out goes indirect injection and in comes common-rail diesel injection, DICOR in Tata Motor speak. Does the new engine make a difference in the Indica eV2? While the old IDI engine continues in the Indica, sold in markets where BS IV emission norms haven't yet come into force, other markets get the DICOR powerplant. The 1396cc mill is the same CR4 common-rail diesel that does duty in the Indigo CS and produces 70PS of power at 4000rpm and 140Nm of torque at 1800rpm. This is a welcome boost in power from the 58.5PS that the old IDI engine used to make - an impressive and much-needed 32 per cent increase. It's not just the power outputs that have gone up, the engine is now more responsive as well as refined compared to the old engine. 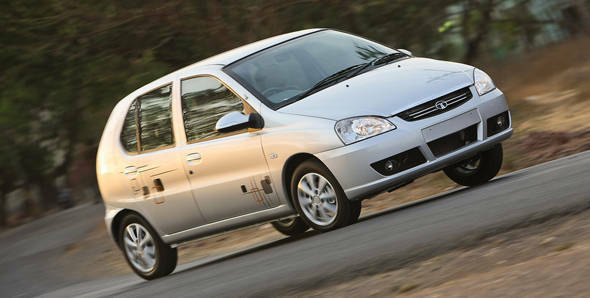 However it still has some way to go to match the refinement of Tata's own Quadrajet diesel in the Vista. also trace its roots to the birth of the Indica. It no longer is as bad as stirring a pot of wet mud but the throws are still too long and there isn't too much in the way of slickness to its operation. Auto Drive Assist is a unique feature in the eV2 which works like an automatic hill hold function ensuring the car won't roll back as you release the clutch on an uphill section. It works rather well and negates the use of the handbrake while making those steep uphill starts. Another feature is the Clutch-To-Start, that prevents the motor from cranking up unless the clutch is depressed. It ensures that drivers don't accidentally crank the engine and engage the starter motor when the engine is running though it has to be said that the engine isn't that silent at idle for drivers to think it is off. With the DICOR engine the Indica eV2 has become 70kg heavier but then it has the power to overcome the weight gain. A 0-100kmph time of 15.6 seconds is rather impressive making it over two seconds quicker than the old engine. This is as quick as the 90PS petrol-engine Vista while bettering the acceleration times of the 75PS Quadrajet Vista that takes 16.1 seconds. Finally the Indica doesn't struggle to cruise at triple digit speeds and the next time you're in an Indica taxi (provided it's one of these new ones) you needn't worry about the cabbie switching off the air-con compressor when going up a ghat road. The eV2 takes 19.75 seconds to cover the quarter mile while it peaked at a top speed of 159kmph. Roll-on figures are not very impressive though due to the turbo lag with the 40-100kmph run in 5th gear taking 37.59 seconds. The USP of the Indica eV2 is its fuel efficiency - haven't you seen the 'most fuel efficient car in India' ad campaigns? That claim is on the back of the ARAI-tested economy figure of 25kmpl which does make it the most efficient diesel in the country. On our city efficiency runs we got 15.6kmpl while on the highway she managed 22.5kmpl translating into an overall figure of 17.3kmpl and a total range of 641km. The Indica has been around for over a decade but one thing you can't fault her on is space. This is still one of the most spacious hatchbacks in the country and that's why it continues to be popular in the taxi market. A decade old design will have flaws though - the ride is unsettled and lacks the compliance we're used to these days, the handling is far from composed lacking in precision and handing out heaps of body roll, the steering is completely vague and lifeless and the ergonomics aren't good. The driving position for instance is poor with a low seat height and a high set steering wheel which cannot be adjusted. Refinement isn't great either. A valiant effort has been made to improve the ageing interiors. It now gets two-tone finish to liven up the cabin and fake wood trim which looks cheap and is completely out of place. But the Indica still makes a case for itself with its pricing. The top-of-the-line LX costs Rs 4.57 lakh (ex-showroom, Mumbai) and when you take into account the features list - power steering, front power windows, split rear seat, 14-inch alloy wheels, leather gear shift knob, front and rear fog lamps and a stereo with aux, USB and even Bluetooth support - this is great value. The basic L variant, at 4 lakh, is the cheapest diesel car in the country and that should continue to see it find favour with the taxi trade.